Portable and lightweight, the ACR38U PocketMate II Smart Card Reader is a USB-sized device that transforms into a smart card reader for full-sized contact smart cards with just a single swivel motion. 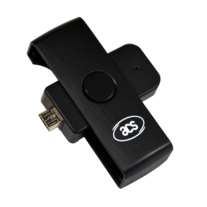 With its MicroUSB OTG interface, it supports most smartphones and tablets, and can be easily integrated with any mobile device running on the Android platform versions 3.1 and above. Additionally, it may be used with Windows, Linux, or Mac operating systems, because of its PC/SC and CCID compliance. 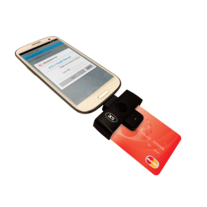 It can run applications that use full-sized contact smart cards and meets security requirements in various fields, including m-Commerce. ACR38U PocketMate II supports ISO 7816 Classes A, B, and C smart cards (5V, 3V, and 1.8V), microprocessor cards with the T=0, T=1 protocol, and common memory cards. It has a smart card read/write speed of up to 344 Kbps. 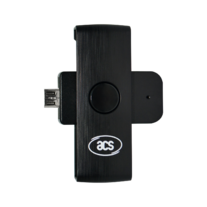 This small device proves to be a powerful smart card reader, as it houses the ACR38 core, which has been proven to support highly demanding smart card applications. Built with a modern and functional design, the ACR38U PocketMate II is a smart card reader that is particularly recommended for frequent travelers who need to complete transactions securely on the road.